Amazing little creatures, and easy to care for too! Description: These very intelligent aquatic creatures spend their entire life in the water, and only require 10 gallon tank. They are friendly and can be kept together. Living up to an amazing 10-20 years the Axolotls is a very hardy freshwater aquatic species (Grows 7-10 inches sometimes up to 12 inches) native to Mexico which possess features typical of salamander larvae , including external gills and a caudal fin extending from behind the head to the vent, but stay completely aquatic its entire life unless metamorphosis occurs. Metamorphosis is a rare occasion which occurs when water becomes toxic/unbearable for the axolotl to live in. Their heads are wide, and their eyes are lidless. Three pairs of external gill stalks originate behind their heads and are used to move oxygenated water. The external gill are lined with filaments (feather looking things) to increase surface area for gas exchange. 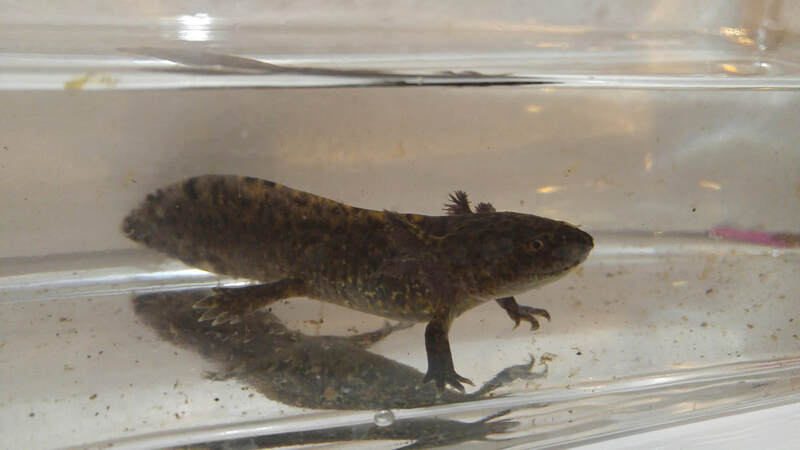 External gills are used for respiration,pumping stored oxygen from gulping air from the surface to provide oxygen to their lungs. An Axolotl has amazing regenerative abilities if injured, even to the point of losing a body part the Axolotl will heal/regenerate it within a month or two. 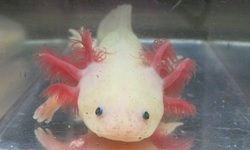 Feeding: Axolotls eat every other day and when fully grown 3 times a week. They eat just about everything (bloodworms, earthworms, tubifex worms,blackworms, shrimps, feeder fish, ﻿pellets﻿, and strips of beef heart or other lean red meat). Requirements: 10 gallons each when adult size is reached. Keep at cool temperature (preferably in basement), Axolotls require NO heat, NO gravel, and NO filter. However it's best to provide a filter for your Axolotl. When using gravel, make sure that it is not smaller than 3.5 inches. Sand is recommended instead of gravel and you can pick up a bag of play sand from your local hardware store. It works great and it's what most hobbyists use. Axolotls like to explore new surroundings. Once in a while change the layout of the aquarium so that your Axolotl doesn't become bored. Once you put your Axolotl back in the tank, it will start to re-explore its new surroundings. Once upon a time they were being used for cancer research in a lab and the GFP (Green Florescent Pigment) genetic was injected into the Axolotls to allow them to glow and the cancer lump not to. They would cut off the limb with the cancer and watch the limb regenerate with full mobility in the span of a month and the glow allowed them to see their process with the naked eye. They did this by combining jelly fish DNA with Axolotl DNA now the genetic is recessive. Now there is no harm or defects to the Axolotls that contain the GFP genetic trait as it just gets passed down from generation to generation. The GFP Axolotls glow under black light, blue light and UV light. Wild types vary in colour, but are generally a shade of dark brown with black, yellowish, and shiny patches/speckles. Commonly known as leucistic are white and have dark eyes. Golden Albinos have a golden colour with red/pink eyes. Melanoids are very dark in colour, and their eyes do not have a shiny ring around the pupil. (In the photo to the left, the dark Axolotl at the top is a Melanoid). Albinos have white skin with red/pink eyes. These Axolotls contain a Green Florescent Pigment that enables them to glow under black light, blue light and UV light.